Back on Track Adult Literacy Program provides basic reading, writing, math and life skills training for the homeless. Referral and financial assistance service to help prevent homelessness. This service is aimed at addressing issues that prevents clients from becoming self-sufficient and which, if not addressed, could eventually lead to eviction and homelessness. Services include information and referral assistance, employment assistance, and financial assistance. Financial assistance is used to pay past-due rent to prevent eviction, and utility assistance to prevent termination of services. “Worth It” Homeless Outreach target homeless individuals in N.O. and surrounding areas. H.O.E​.M. is a strong advocate for the rights and needs of the homelessness, and we are proud to be part of a larger community that is working together to address these traumas and their root causes. We partner with local nonprofits, advocacy agencies, faith-based organizations, civic groups and county to help our clients achieve the best outcomes. 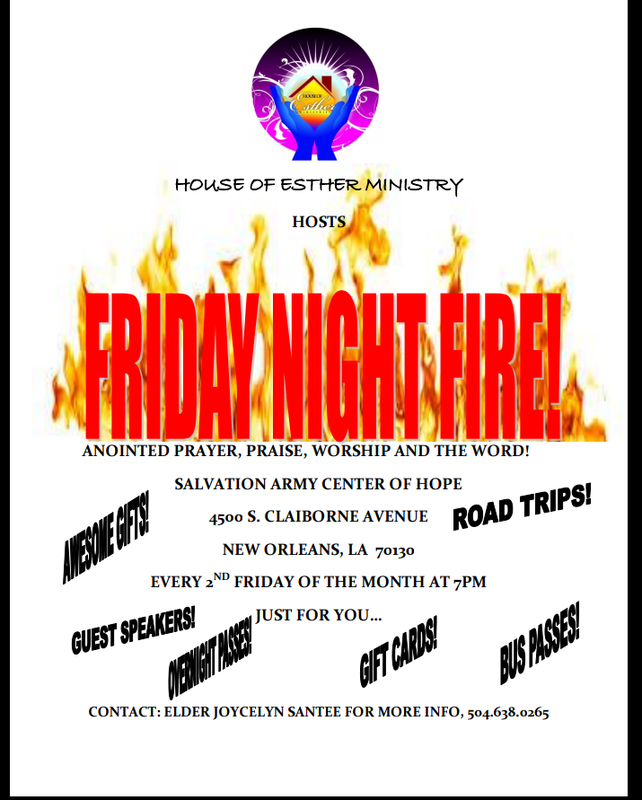 Friday Night of Fire ​is a bible study every second Friday of the month.